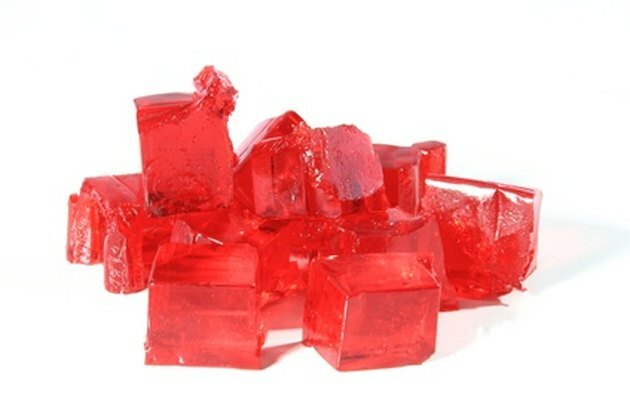 Red Jello, while tasty, can leave a hideous stain on carpeting. The Jello melts quickly, allowing the red dye to penetrate and stain carpeting within a matter of minutes. The dye is not easily removed with most carpet stain-removal products, so the most effective alternative is to simply grab a few household items and get to work at removing the Jello stain. Blot the stain as soon as you notice it, using clean paper towels. Continue blotting until the paper towels come back clear of Jello transfer. Drizzle household ammonia over the stain and continue blotting with paper towels. Re-apply fresh ammonia and more paper towels as needed until no more of the stain is being removed. Turn an iron onto low heat and allow 5 minutes for the iron to heat up. Drizzle another light layer of ammonia over the stain. Saturate an old cleaning rag with warm water and wring out excess moisture. Place the rag over the Jello stain and ammonia. Slowly press the iron onto the cloth. The damp rag will prevent the carpet fibers from burning, pull the dye out of the carpet and transfer it onto the rag. Spritz the cloth with fresh water as needed, as you do not want the cloth to dry out entirely. Repeat until all stain has been removed. Mel Frank is a professional freelance writer with over 15 years of writing experience. She has completed a wide variety of writing assignments for a number of publications that include CNN and various websites. Frank received a Bachelor of Fine Arts from a prestigious university in Pennsylvania.